Enjin is a giant in the world of gaming websites, powering more than 18 million guilds, clans, and communities. One look will show you why. Enjin offers an extensive array of features for your gaming community: souped-up forums, donation and store modules, voice server integration, and more. There are some snags, like an unwieldy theme customization interface and considerable resource limitations on the free plan. You'll need a paid subscription to get the most from your Enjin account, but the plethora of features and conveniences you'll get are well worth the cost. If you want to run a website that enhances your community members' gaming experience in ways big and small, Enjin is the way to go. Extensive Array of Modules: Enjin boasts of over 50 ready-made modules, including robust Donation and Store modules for easy revenue. Full-Featured Interaction: Enjin has rich forum features, social networking elements like messaging and profiles, and voice server support for top-quality community interaction. Game-Specific Integrations: Enjin supports games ranging from Minecraft to World of Warcraft, and you'll find deep custom integrations for each one. Advanced Security: Enjin shields your community using advanced threat screening and DDoS protection. Mobile Apps: Enjin's iOS and Android apps let you interact with your gaming communities on the go. Limited Design Customization: Enjin's block-based layout manager is clunky, and its Theme Editor is only available to paid users. Enjin’s free plan offers a taste of the powerful Enjin ecosystem, though it will feel underpowered for all but the smallest or newest gaming groups. It’s a decent package, but as with many website builders, Enjin saves most of its best features for its paid plans. When signing up for a free plan at Enjin, it’s best to recognize it for what it is: a way to see if you and Enjin will get along before you dip into your wallet. A free Enjin account will let you create a basic website, complete with access to many free picks from Enjin’s theme gallery. You can also deploy many of Enjin’s widgets and plugins, including modules like the stellar DonationCraft and Enjin online store. However, your site will still use an Enjin subdomain (yoursite.enjin.com), and your pages will still sport ads from Enjin. You’ll also get very limited use of Enjin’s automations (just 1 each for action and moderation) and Minecraft server sync. Looking for advanced features like voice server integration and game-specific data imports? You’ll have to sign up for a paid plan to get those. If you’ve got a big gaming group, or if your website needs more than the most basic features, then getting an Enjin premium plan is the only viable option. Are Enjin’s premium plans worth it? Yes! More to the point, they’re the only way you’ll get to reap the benefits of Enjin’s extensive gaming website system. And make no mistake, Enjin’s impressive system presents plenty of benefits. Enjin is far more than a simple website builder. In fact, it’s miles ahead of the competition in terms of sheer breadth and depth of features, with everything from sophisticated monetization plugins to game-specific integrations that seamlessly bridge in-game and real-world activities. Enjin’s theme gallery packs over 300 website themes. Most will work with any game you want to build your website around, while others are designed for specific titles like Minecraft, World of Warcraft, League of Legends, or Final Fantasy XIV. Enjin’s responsible for hundreds of the themes on offer, but what’s great is that user-designed themes further bulk up the selection. You’ll find many custom themes designed by fellow Enjin users, often available for free. While there’s a staggering number of options, though, most of Enjin’s themes tend to stick to a formulaic default layout. 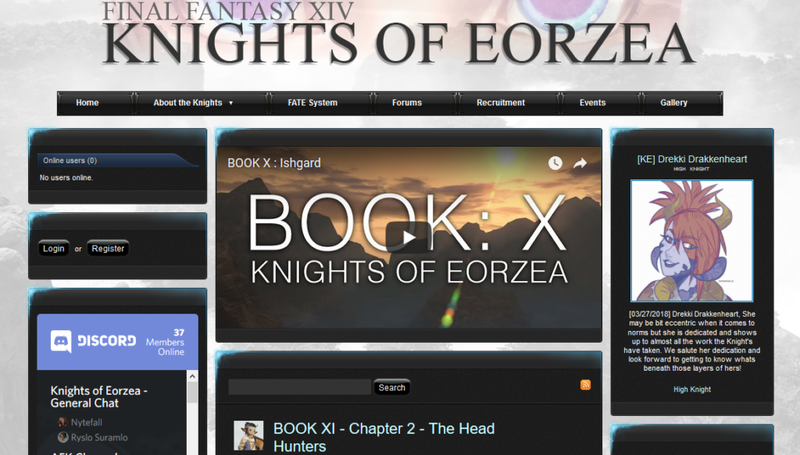 You’ll get a banner area, navigation bar, and one or two sidebars flanking your main content section. You can rearrange these sections and change each one’s contents, but there’s no denying that many themes can feel generic unless you pour time and effort into customizing them. On a Free plan, the most you can do is play around with your website pages’ layouts. Enjin gives you a somewhat clunky panel editor based on “blocks.” Each module (e.g., chatbox, login pane, activity feed) is a “block” that you can drag and drop into your preferred section on the page. You can also resize each section, so a typical content-and-sidebar set can transform into a two-column layout with a smooth glide of the mouse. However, you’ll be stuck with the default visuals of your chosen theme unless you’re on a paid plan. Enjin packs most of your stylistic customization options into its Theme Builder. Here, you can change the colors of different page elements or sections, change your background images or header banners, and more. You can start from scratch or build off an existing template; the latter option is handy if you want a quick base for your design ideas. 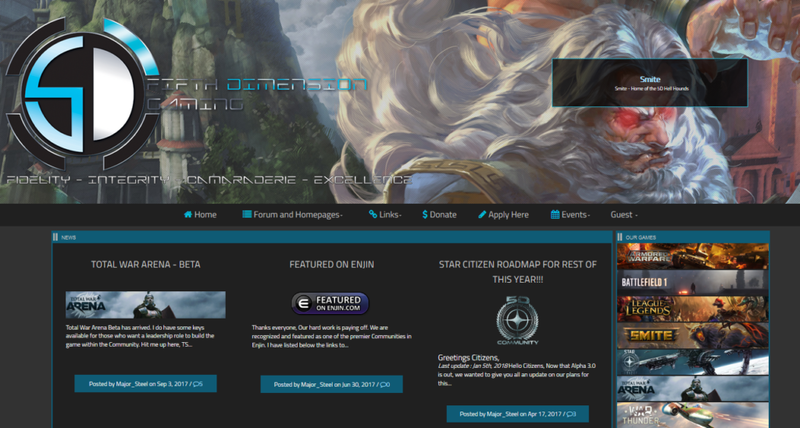 The Enjin Theme Builder’s interface isn’t as sophisticated or user-friendly as you’d get from a general website builder, but it does an adequate job. Compared to some of Enjin’s top competitors, for example, the Theme Builder gives you more granular control over your website’s look and feel. Plus, if you’re a web design whiz, you can also go all-out and use your own custom CSS instead. DonationCraft is one of Enjin’s flagship features, and deservedly so. 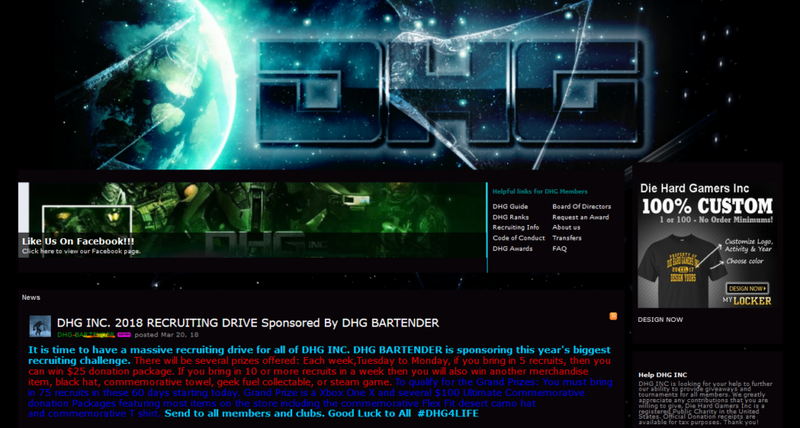 The DonationCraft plugin’s monetization capabilities are unparalleled among gaming website builders. If you’re planning to run a gaming-related shop, whether in-game or on your website, DonationCraft alone justifies getting yourself a premium Enjin plan. As the name implies, DonationCraft is a monetization plugin designed primarily for Minecraft players looking to turn a profit. It lets you take donations to keep your server running—or, alternatively, put products up for sale. Like any good online store module, DonationCraft allows different kinds of products, from in-game items to rewards, with custom variants for each. You can even create custom product packages, which can be personalized depending on a customer’s transaction history. Add to that the robust discount coupon system, which lets you issue advanced discounts, and you’ve got more than enough tools to reward your most loyal customers. How do you know a customer’s been coming back? DonationCraft sports a detailed statistics logger. You’ll see the nitty-gritty of your shop’s traffic, including details for all transactions and payment histories. This means you can take payments in different currencies, through methods as varied as credit cards, online transfers, and cryptocurrency. You can also set up automatic subscriptions so customers can get recurrent billing for the packages they regularly purchase. If you’re using DonationCraft for your Minecraft game, you’ll be pleased to know that it can power in-game stores, even letting you set up custom server commands for purchases, charge-backs, refunds, and more. You can also run multiple stores on different servers: all the controls will be in your centralized DonationCraft dashboard, so management’s a breeze no matter the scale of your operations. However, as refined as DonationCraft’s Minecraft integrations are, you can also use the plugin to create a “generic” (or so Enjin calls it) online store fit for use with any game. You might not have the same depth of in-game deployment as you’d get for Minecraft, but DonationCraft will still give you a powerful and robust system for selling items or ranks, juggling orders, tracking payments—and making a tidy sum along the way. Many gaming website builders exist on the periphery of your gaming experience: they might give you a website that’s about your favorite game, but many lack the features to tie that website directly into your game experience. Enjin does things differently. Whether you play FIFA or Minecraft, League of Legends or World of Warcraft, World of Tanks or Call of Duty, Enjin has a varied buffet of widgets, integrations, and plugins that will turn your website into a rich complement to your in-game accomplishments and adventures. You and your users can link game characters, record match statistics, track player performance and inter-guild results with leaderboards, and more. Enjin’s systems handle all of this data with ease. Statistics like boss progression and ranks sync automatically. You can set your website to broadcast your server status in real-time. Your profile and stable of characters reflect their changing status in the game without you performing any tedious bookkeeping. Your recruitment page reflects an up-to-the-minute breakdown of the different roles in your guild. There are modules to help you manage raids, keep track of loot, or schedule in-game events. And all of that’s just the beginning: you’ll have more features at your fingertips depending on your specific game. What makes Enjin’s deep game support truly fantastic, though, is the sheer ease with which you can use everything. You can add all that functionality to your website without knowing how to write a single line of code. Enjin lays everything out in a user-friendly manner: just click on the integrations you want and add them to your website. Communication fuels any strong online community, and that includes gaming groups. Enjin acknowledges this by equipping you with several tools to foster interaction among your community members. You’ve got the standard news feed and calendar, which gives community members quick updates on the most important developments for your group or server. 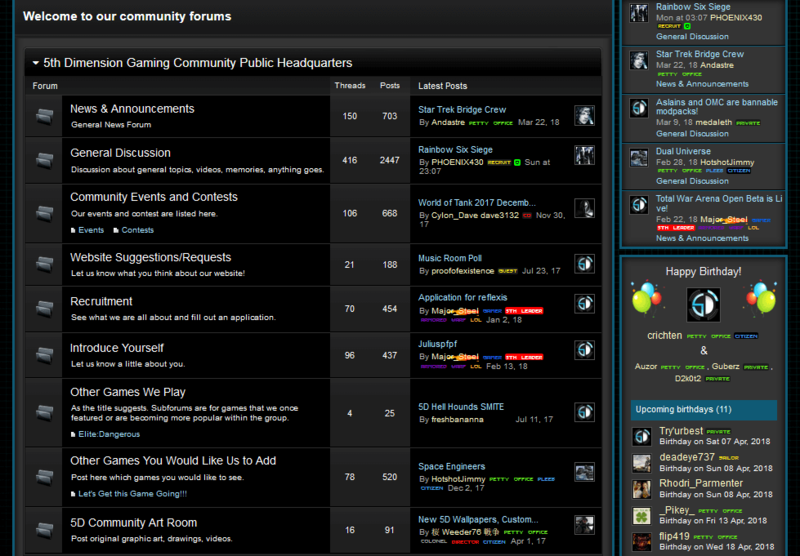 There’s also the forums module, which includes a forum vote system that lets users upvote (or downvote) posts. Enjin lets you integrate this into your community’s point and award system, too, so you can encourage positive, helpful interaction by having concrete rewards for good forum contributions. There are also chatboxes, comment boxes, plus notifications of who’s online or spotlights for your community’s latest set of top members. You can also give community members more to talk about, thanks to Enjin’s support for embedding feeds from different third-party services. For example, Enjin lets you add your Twitch channel or a Twitch showcase module to your website’s homepage, feature RSS feeds (great for keeping everyone updated on important gaming news), or incorporate rich media via embeds from YouTube. It’s worth noting that your Enjin account also doubles as a social profile in itself. You can use it to interact with the larger Enjin community. Broader social circles can help your community grow further: after all, you never know where you might find your best recruits. Communication isn’t all fun and games, though. Luckily, Enjin also provides a support ticket module that lets you take support requests from your community members—even in-game. This module is limited to Ultimate plan subscribers, but it’s worth keeping in mind if you’ve got a sizable community that expects rapid assistance from you. Enjin one-ups many of its competitors by providing excellent mobile apps for iOS and Android. The Enjin apps are geared more towards the social side of Enjin (rather than the website management side): you’ll find quick links to all your communities, mobile-optimized WYSIWYG editors for firing off quick posts in your site blog or forums, and more. Enjin streamlines the process of expanding and managing your community with active recruitment boards and tools like customizable application forms. You can set up different form types depending on the position you’re looking to fill (staff, guild member, moderator, etc. ), and the questions for each form are completely up to you. As for screening applicants, Enjin gives you granular permissions control. You can grant recruitment evaluation powers to select staff or moderators. Enjin’s system also lets you set up automated notifications for each step of the process (from application submission to approval or rejection), ensuring prompt updates for applicants, no matter how many—and without adding to your admin team’s work, either. As with many gaming website providers, Enjin also maintains recruitment boards where you can advertise your group and spread the word if you’ve got applications open. Enjin’s recruitment page is easy to navigate: your group will be classified according to the game you’re recruiting for. Your placement on the list will be based on the kind of account you’re using (premium plans get higher listings), whether you’ve paid to be featured, and the number of users in your group. Enjin serves as host for all the sites made using its website builder. This saves you the trouble of seeking out a different web host, not to mention maintaining servers and monitoring system performance to ensure good uptime for your website. With Enjin taking care of your website’s underlying architecture, you can focus on designing and running the best gaming community website possible. Enjin’s Help Center provides video tutorials and step-by-step guides for the most common operations and issues you’ll encounter while building and maintaining your website. If you do run into a stubborn problem, you can also consult fellow Enjin users in the lively Enjin community forums. For more direct assistance, Enjin lets you file support tickets via the form on their website. There are no real-time support options (like phone or live chat), though. Enjin has built a vast and powerful web of features for running different kinds of gaming websites, but Minecraft is by far its most prominently supported title. 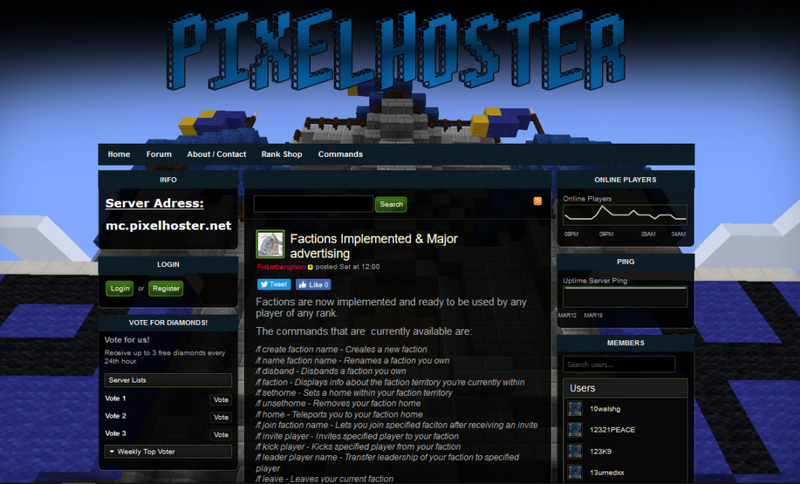 If you’re looking to build a Minecraft website, there’s no better website builder than Enjin. You’ll get a specially crafted Minecraft plugin from the get-go. This plugin lets Enjin sync with your Minecraft server, melding your game data with everything from your website’s forums and community member profiles to your online store. 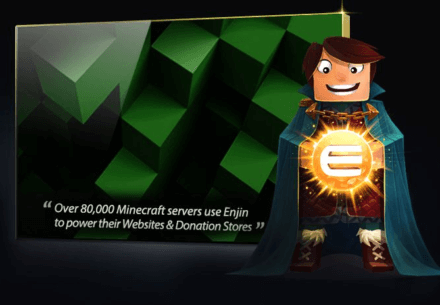 Speaking of ecommerce, Enjin’s impressive DonationCraft plugin is at its best when used for a Minecraft website, because many of its features (e.g., in-game server commands) were built with Minecraft gaming in mind. We discussed DonationCraft more above, so if you’re a Minecraft player looking to monetize, don’t miss that section. DonationCraft is just the tip of the iceberg, though, as Enjin sports many Minecraft-specific modules and widgets. There’s the Vote for Diamonds/Votifier module, for example, which is a sophisticated rewards module that lets you run a vote for rewards system, complete with voting list and advanced conditions. You can sync multiple Minecraft servers with one account, which makes managing different servers incredibly convenient. 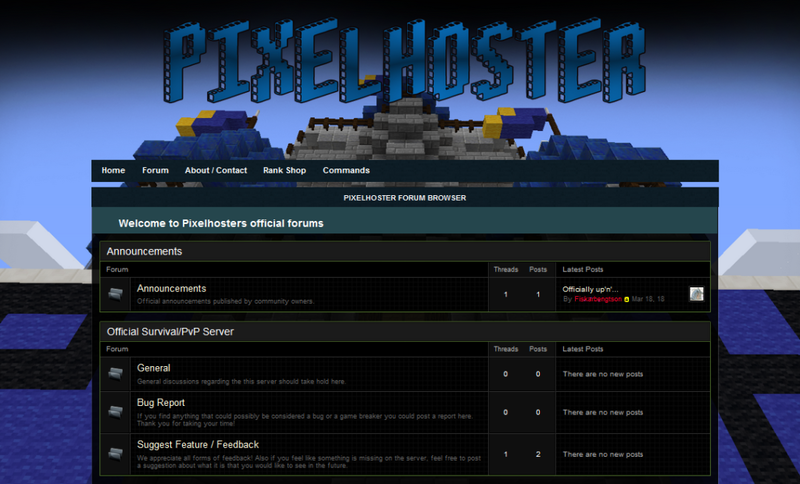 Each website (and synced server) will have its own section on your admin panel. Is Enjin the Best Way to Fire Up Your Gaming Website? Regardless of the game titles you’re building your website for, Enjin is a powerful, feature-packed builder that will serve your needs well. The themes might need a fair bit of modification to slough off that generic feel, but it can be done, often without even typing a line of code. And once you move beyond the aesthetics and into sheer functionality, there’s just no contest. Enjin’s feature suite blows most competitors out of the water. An account gets you much more than a simple website builder: you’ll get game-specific integrations, a variety of communication modules, stellar plugins and widgets to power up your website, and more. Enjin has clearly put a lot of thought into crafting tools that will knit your in-game and real-world endeavors together. This is a gaming website builder that knows what features will enhance gamers’ experiences and pours its energies into delivering those features to you in the most accessible, user-friendly way possible. If you want to create the kind of gaming website that can serve as the beating heart for a dedicated gaming community, then Enjin’s the way to go.